Halloween is the scariest time of year for many reasons. For those with food allergies, it can be even harder to manage but it can be done! 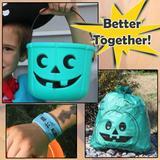 You know we love all things TEAL, The Allergy Superheroes Teal Pumpkin Bundle is a favorite to celebrate the season! They have all kinds of great awareness products too so check them all out. They have been kind enough to offer this great prize pack to someone. Just enter here and feel free to share!